Running a public water utility isn't like any other business. This is because water is essential to everyone, at every economic level. Also, a city water utility isn't out to make a profit. It can't simply raise its prices to cover the cost of rising expenses or decreasing revenue. An elected city council, board or regulating commission must approve rate changes and that doesn't always come easily. It is a massive undertaking to reliably deliver safe and affordable water directly to homes and businesses and costs are rising. Water utilities are facing higher energy costs and expensive new water quality regulations. This is in addition to the cost of ongoing operations, hiring and keeping the best professional staffs, and maintaining and expanding extensive infrastructure, including miles of pipes, pumps and reservoirs. In addition to the obvious costs, water utilities are faced with uncertainties that could impact their finances, such as severe drought or an economic downturn. So understandably, building a reasonable, yet adequate, water rate structure is a hot topic among water professionals. That’s why nearly 100 of them gathered at a workshop last month presented by AMWUA and the Alliance for Water Efficiency. The objective of the workshop was to share new tools, information, and resources to help water utilities develop and successfully set effective rates that work for the utility and their customers. Well-crafted rate structures provide revenue stability for the utility, ensure water flows reliably and safely, and encourage the efficient use of water, while still being affordable for the customer. That’s not an easy balancing act. Developing and setting effective rates is a complex process. Water professionals must determine how much water customers will demand five or ten years from now, how much it will cost to provide it, and determine rates that will be equitable and still cover rising expenses. Like any business, water providers will need to continue to keep customers informed about what it takes to deliver water to their homes and businesses and why rate increases are necessary. Members of AMWUA's Board of Directors - Phoenix Councilwoman Thelda Williams, Avondale Councilman David Iwanski (right) and Mesa Councilman Kevin Thompson (left) - talk about the difficulty of raising water rates. Finance staffs, water resources managers, conservation staffs, public information officers, utility directors, city managers, and elected officials all play a role. At the workshop, these professionals learned about new tools to help manage uncertainty, heard first hand about the challenges elected officials face in approving rates, and gained insight into the success of the Tucson area's Metro Water District in setting a rate structure that balances needed income, uncertainties, and affordability. Expert staff from the Alliance for Water Efficiency shared strategies for aligning water rates, revenues and resources and led an in-depth training on the Alliance’s Sales Forecasting and Rate Model. Learning is never over for water professionals. AMWUA cities' staffs collaborate regularly to share information and experiences that help streamline and strengthen their ability to ensure reliable, sustainable, secure water supplies for the Valley’s residents and businesses. The Alliance for Water Efficiency is a stakeholder-based nonprofit organization dedicated to the efficient and sustainable use of water in the U.S. and Canada. AMWUA’s assistant director serves on the Alliance’s Board of Directors. 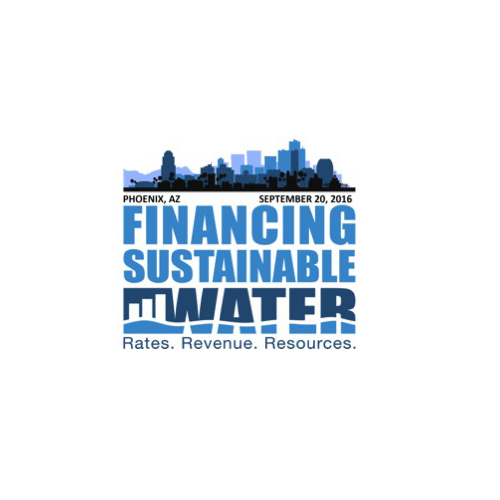 Information on the Alliance’s Financing Sustainable Water initiative is available at financingsustainablewater.org.